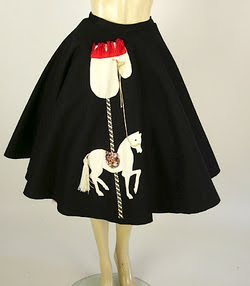 What vintage wardrobe is complete without several fantastic skirts? For most of us, skirts aren't difficult to find and if you're like me, you have more skirts than blouses to match! What length is appropriate for my vintage wardrobe? When I go shopping for skirts, if the length isn't just right, I don't buy it. I prefer a skirt that is no longer than mid-calf length and no shorter than mid-knee. This is really a matter of personal preference. 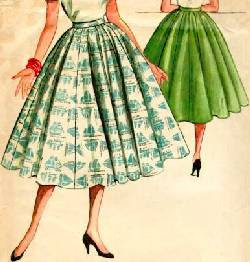 I've seen lots of vintage gals wear skirts above the knee or down to the floor and they look fabulous! If your wardrobe goal is to capture the style of a particular decade, study the style from that era and use it as your guide to buying skirts. 1920's-For the first time in centuries, ladies sported short, knee-length skirts. Dresses and skirts were very straight with a dropped waist (around the hip). Longer skirts were often worn for classy evening attire. With dressmaking techniques such as draping, skirts were made to cling to the body. Day dresses and skirts often hung straight down from the hips or waist. 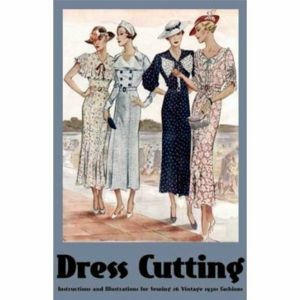 1940's-With rationing and fabric shortages during WWII, hemlines rose again to knee-length, sometimes longer to mid-calf. Skirts continued to remain close to the body for the most part. Full skirts wouldn't be a common garment until after the war, when Christian Dior invented the "New Look". 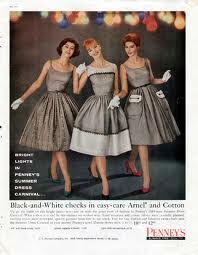 1950's- After being deprived of luxury during the war years, ladies of the 50's wanted to indulge. 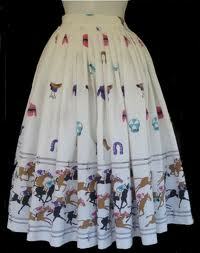 In the early to mid 50's full skirts and crinolines were all the rage! When Dior passed away and left the fashion world in the hands of Yves Saint Laurent, womens fashion saw a dramatic change in skirts with a more fitted look. Skirt length of the 50's were as short as knee-length and as long as mid-calf. Elegant evening gowns and skirts were often down to the floor. A circle skirt is made from an entire circle of fabric. The skirt is full but drapes nicely from the waistline without gathers or pleats. 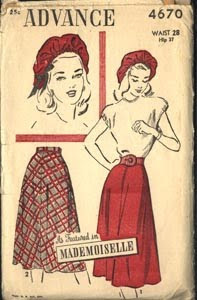 Poodle Skirts were often cut in the circle skirt style. You can buy or make lovely vintage circle skirts with embroidery, beading, applique and other pattered detail along the bottom of the skirt. Circle skirts can be worn with or without a crinoline underneath. a-line skirts are fitted at the waist and hip and flare out gently towards the hem, giving the skirt an "A" shape. 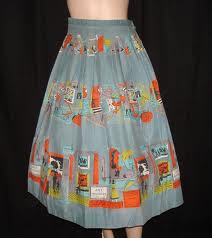 A-line skirts are easy to find at thrift stores, vintage clothing shops and modern clothing stores. 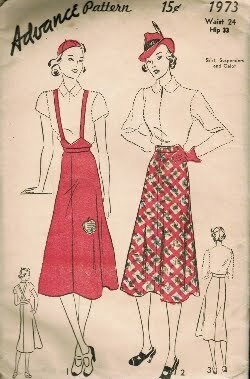 Look for pencil skirts for your vintage wardrobe in solid colors, wool plaid and hounds tooth. A-line skirts are very flattering to most figures. Pencil skirts are completely fitted from waist to hem. They often have a kick pleat in the back or on the side so you can walk. Pencil skirts are usually knee length to mid-calf length. Curvy gals, don't be afraid to try a pencil skirt! I know that accentuating the hips and rear are usually the last thing you want to do but with the perfect pencil skirt, it can really give you that desired vintage hourglass shape. Use what you have, girls! 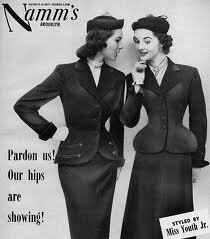 In the early days of pencil skirts, they were often worn with jackets as a suit set. Tulip skirts are fitted at the waist and hip, down to the mid-thigh. They flare out at the bottom, creating a lovely ruffle or trumpeted effect. The shape resembles an upside down tulip. Skirts style from the 1930's often had a very tulip look to them, even if they weren't always a true tulip. 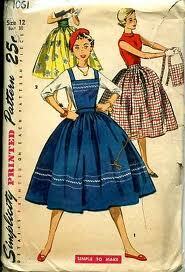 The Dirndl (or Tyrolean peasant skirt) is a very full skirt with gathers at the waistline. 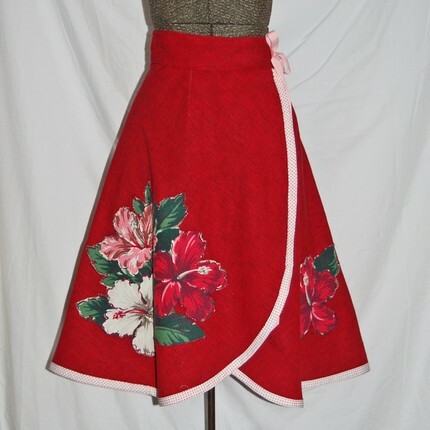 This style of skirt was made popular in the United States in the late 1940's-early 50's when a New York society woman brought them back from Europe and wore them around South Hampton and Palm Beach. These charming skirts were a great casual option for ladies in the suburbs and were often hand-worked with dyes, embroidery and bright colors. 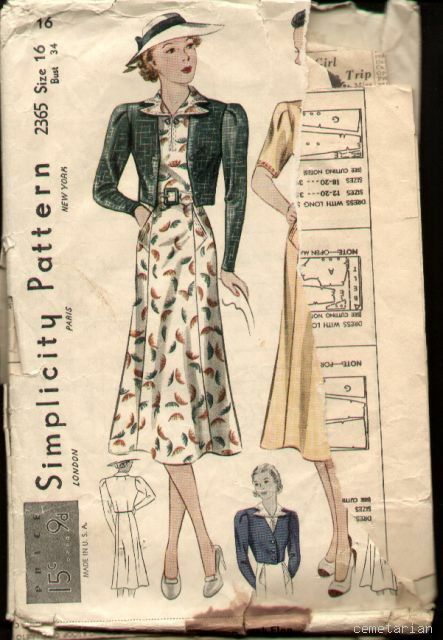 This peasant skirt really re-established the common A-line house dress of the 1940's and made way for the full skirted shirtwaist and other full-skirted dresses of the 950's. Dirndl skirt lengths range from knee length to floor length. Modern versions of these skirts can be found at any clothing store.I love Dirndls but curvy gals beware- those extra gathers at the waistband can make you look heavier at the waist and hip. Try to try on a dirndl skirt before buying to make sure it flatters your figure. 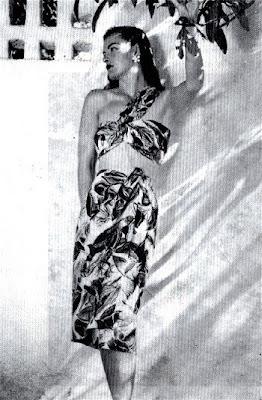 Wrap skirts wrap around your waist and tie to fasten (like the skirts from the 1950's Swirl dress). Wrap skirts can have pleats or gathers or be fitted to the waist and hips in an A-line or pencil fashion. In the 40's and 50's, many play suits were made with matching wrap skirts. My favorite type of vintage wrap skirt are the tiki sarong skirts and dresses- a perfect garment for hot summer bbqs! How much do you love this tiki sarong from babygirlboutique?! It's sold out right now, but I hope they get more in stock! This post certainly doesn't cover every variety of skirt but it should provide a good starting point for building your collection of vintage and vintage-inspired skirts. Good luck! Great post! 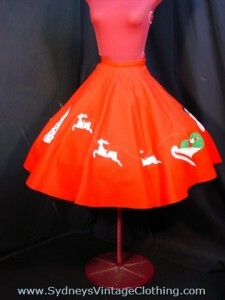 I just bought a great 1950s shirtwaist dress with a full dirndl skirt. It's darling, but I need to find a crinoline to go underneath to really show off the fullness of the skirt. PS--I love your new blog look! great post! i for one find it rather difficult to find vintage skirts to fit me, my waist to hips ratio seems to be at fault, at 26" waist and 34" hips i can either find things that fit on the hips but the waist is tiny (22"), or the other way around, things that fit in the waist come with 40" hips, so it's rather frustrating. you just can't NOT look good in a sarong wrap skirt. It's a scientific fact. I really do love this series! How funny that you actually call Dirndl skirts Dirndl - I am Austrian where the Dirndl comes from and the whole dress is actually a beautiful garment for the curvy figure but I can see what you mean when you describe just the skirt (which I don't know). Have you ever heard of Lena Hoschek? She is an Austrian designer, getting internationally popular now, and she combines 40s and 50s elements with traditional Austrian Dirndl (or genereal folklore wear). She's just brilliant! Too pricey obviously but a great inspiration. I've seen Dirndls and I love them! When I was researching skirts for this post, I found a historical fashion book from the 60's that described these skirts as "Dirndl skirts". When they were made popular in the US, I guess that the only way to describe them accurately was to compare them to the dirndl since they're not a-line and they're not exactly a circle skirt either. It makes sense, I guess! I've never heard of that designer. I'll have to look her up! I've been dying to make a Dirndl (or dirndl skirt) of my own. I love the colors and details that go into them- lovely!